A 40-year-old woman and her family were heckled and intimidated on Wednesday as they walked towards the Sabarimala temple, which opens this evening for the first time since the Supreme Court overturned a centuries-old ban on women of menstruating age -- 10 to 50 years -- entering the shrine. Madhavi, who is from Andhra Pradesh, began the climb to the hilltop shrine after reaching the base, Pamba, along with her children and parents. She had braved every obstacle in her way, with the police walking alongside. But the police stopped near the shrine, claims the family, and asked them to proceed on their own. In visuals, Madhavi is seen walking with her son and her little daughter, who appears to be scared and in tears. Ten minutes into their trek, the family had to abandon their plans of praying to Lord Ayyappa inside Sabarimala. Protesters were relentless as they chased Madhavi and her family, shouting slogans. They did succeed as the family, afraid to go on, turned back. The Supreme Court last month ended the ban based on the archaic belief that menstruating women are "impure" and cannot be allowed near the deity Ayyappa, believed by devotees to be celibate. 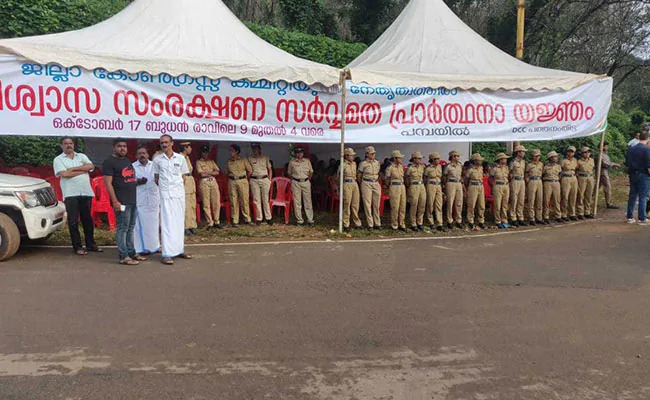 Some 1,000 police, including women, have been posted around Sabarimala and at the two base camps. Barring Kerala's Left government led by Pinarayi Vijayan, the Congress, BJP and numerous Hindu organisations have backed protests against the court order and warned of strong consequences if temple traditions are violated. Another woman, Libi CS, was stopped at a bus stand by devotees. "Is this the way a lady should go to the temple. She claims to have observed the penance but if you look at the beads of the customary Sabarimala necklace, it's very clear that she has worn it today or yesterday. This is not acceptable to us and she won't be allowed to go," said a group of angry women protesters. Libi CS, a journalist, had posted on Facebook her plan to visit the Sabarimala temple. The protesters apparently saw her post and decided to block her the moment she reached a bus stand in Pathanamthitta, 65 km from the temple. "Friends, four of us are leaving to Sabarimala today, which includes atheists like me and two devotees," said Libi's Facebook post. The police shielded her from a group of protesters who had surrounded her at the bus stop. They threatened to burn the bus if it drove towards the temple's base camp, news agency IANS reported.